The hot sizzling summer is right around the corner. Temperatures will be soaring in the Sacramento Valley. Your air conditioning unit will be working hard all summer long cranking out icy cold air to keep you cool. Is your air filter ready for all the action? You should check your air filter monthly and change it every three months, but it all depends on the type of air filter you have. Some filters need to be washed once a month and others once a year. Another good reason to regularly replace your air filter is to help maintain healthy air quality in your home. It cleans the air. If you have pets it’s even more important. Your furry friend’s pet dander can accumulate in your system and spread allergens throughout the home. If you suffer from allergies you’ll notice a big difference. In fact, one of our loyal Bonney customers, Carol from Sacramento, called us to say she “loved the whole house filter which has been remarkable!” She mentioned her husband’s allergies and that he had to take allergy medicine daily. 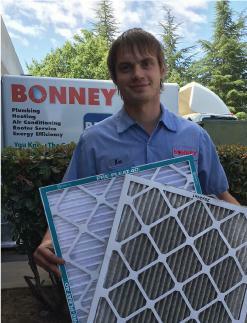 Now he rarely needs it thanks to the whole house filter Bonney HVAC technician Andrew P installed for them. Regularly replacing your air filter is an easy, inexpensive way to save money, extend the life of your HVAC system and improve indoor air quality. If you have any questions about changing your air filter or upgrading your air filter like Carol did, give Bonney Plumbing, Heating, and Air a call at 800-444-0551800-444-0551.